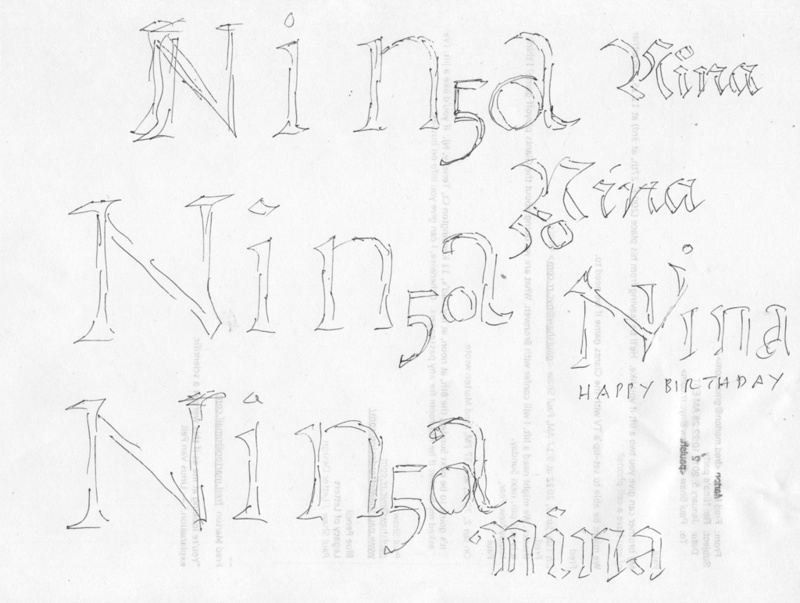 Pencil sketches for Nina 50 card. It wasn’t until I desperately began sketching ideas using blackletter instead of roman or italic that I came up with a successful design. Although textura and rotunda were disasters, bâtarde yielded an answer. 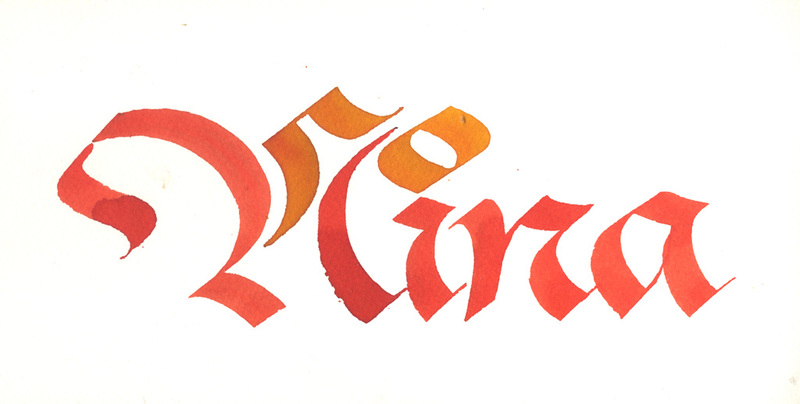 The decorative strokes of N (uncial-based) allowed me to insert a 5 and then it was easy to make the zero follow as the dot on the i. 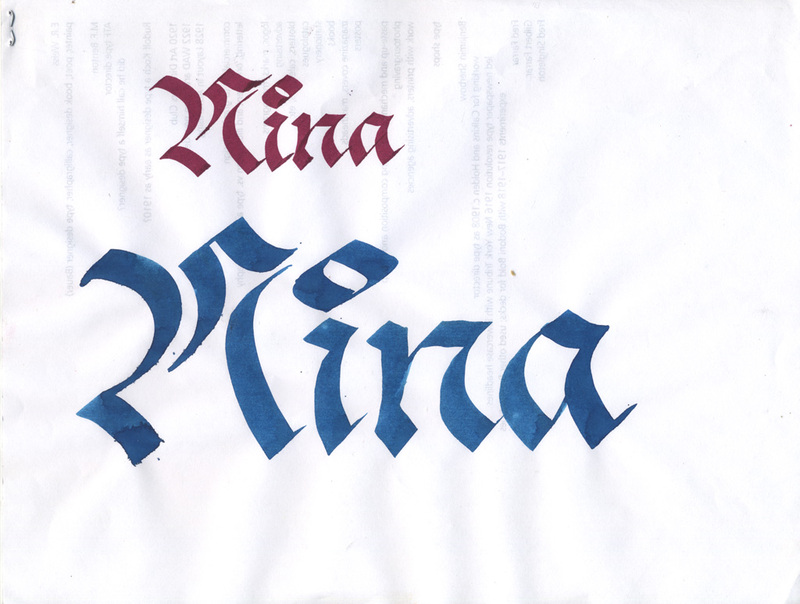 Rough for Nina 50 card using Brause nibs and Pilot Parallel Pen. I wrote it out twice, once with a Brause nib and once with a Pilot Parallel pen to see if if it would work. I then did the ﬁnal with an Automatic poster pen on Arches watercolor paper without any preliminary drawing. The two colors, a spontaneous decision, made the message more festive as well as clearer. This was on the outside of the card and “Happy birthday” (also in bâtarde) was written on the inside. Final Nina 50 card. Written with an Automatic poster pen using Ecoline inks on Arches paper.